In the Create Features pane, feature templates for annotation layers can contain construction tools that create horizontal, straight and curved annotation features, and text that follows along the boundary of a feature. Before you create the feature, you can change the style format and override symbol properties. You can type the text string in the pane, or use the context menu to replace the string with a label expression or field value from a layer in the map. If a tool does not appear on the tool palette, you can add it to the template. For steps to configure the tool palette, see Configure a feature template. For steps to change the curvature of an existing annotation feature, see Change annotation curvature. Horizontal annotation is created with a single click on a map. You can set the angle before you create the feature or edit the vertices of the text and drag one of its coincident baseline vertices. Expand Databases , expand the database containing your data, and drag the feature class onto the map. To create a new data source, right-click the default database, click New, click Annotation Feature Class , type the feature class name, select the coordinate system, and click Create Feature Class. The layer is added to the current map, and a feature template with default settings is automatically created. Click an annotation feature template. The tool palette and a text box appear in the pane. Next to the tool palette, click the forward arrow . The tool palette and the feature attribute table for the active template appear in the pane. Click the text box and type the text string. To replace the text string with a label expression or field value from a layer in the map, right-click, click Find Text and select a feature. Press the N to cycle through the possible text strings. The topmost visible feature in the selection is calculated. If a text string can’t be calculated, the string is set to the word Text. On the Edit tab, in the Snapping group, enable your snapping preferences, and move the pointer back to the map. The text appears on the pointer. Format the text using the formatting drop-down menus. The format changes appear on the pointer. Click the map to create the text, or right-click and use Absolute X,Y,Z . Straight annotation is created with two clicks on a map. 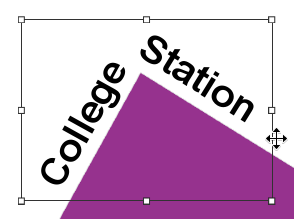 The first point places the text and the second point sets the angle. The baseline becomes nonvisible when you finish the feature. Click the map to create the start point, or right-click and use Absolute X,Y,Z . The text appears on the map and follows the angle of the pointer. Drag the pointer or use the context menu to specify the angle and click the map. On the editing toolbar, click Finish or press F2. Curved annotation is created with three or more clicks on a map. The first point places the text and the second point sets the angle. The third point creates a Bezier curve along which the text conforms. The baseline becomes nonvisible when you finish the feature. Press N to cycle through the possible text strings. Drag the pointer and click the map to set the angle. The text conforms to the contour of the curve as you drag the pointer. Drag the pointer to shape the curve and click the map. Text that follows a feature is created by clicking an existing polyline or polygon feature and dragging the preview of the new text along its boundary. The second click places and finishes the feature. Hover along the selection bounding box until the pointer changes to the move pointer, and click the boundary. Drag the text along the feature boundary. Press Crtl and drag the text to change the distance between the annotation feature and the boundary feature. 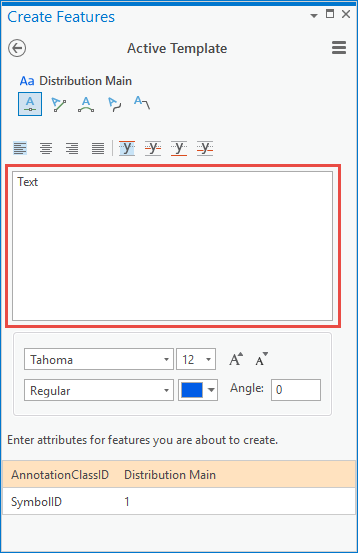 Replaces the text string in the text box with the label expression or field value from the topmost selected feature layer. Selecting feature-linked annotation calculates the text only from the origin feature class. If a text string can’t be calculated, the string is set to the word Text. Steps through the selection when more than one annotation feature is selected using Find Text . Opens the dialog box to specify absolute x, y, z coordinates. Annotation features are textual elements placed on a map to name or describe geographic features. Generally, they are placed alongside labels in a planned visual hierarchy to communicate the importance of a particular feature. You can style them for a particular cartographic aesthetic. Examples include text that emphasizes the name of a country versus the name of a city or the name of a river. You can link an annotation feature class to a geographic feature class and automate specific update behaviors. For example, text strings for feature-linked annotation are linked to the value of a field or fields from the geographic feature to which it is linked. You can also configure linked annotation to automatically add, delete, or move with the linked feature.